Guwahati: It was an emotional yet proud evening for these gentlemen who cherished the hard labour they put into creating a milestone in the history of the country. Meet Swarn Singh and his colleagues as they stood on the banks of the mighty Brahmaputra with the gorgeous Saraighat bridge in front of them which completed 50 glorious years of its service to the people of India, on Tuesday. “It is a lifetime achievement. We are proud of what we have done. We can confidently say that it will serve another 100 and more years without any trouble,” an emotional Singh told Seven Sisters Post as he participated in a programme Indian Railway had organized to mark the 50th year of one of India’s longest doubledecker bridge on Tuesday. The construction of Saraighat bridge was started in January 1959 by Hindustan Construction Company and was completed in September 1962. A diesel engine ran on the bridge on September 23, 1962. However, specific traffic was allowed over the 1298 metre long bridge on October 27 in the same year bringing an end to an era of infinite transportation woes for the region. 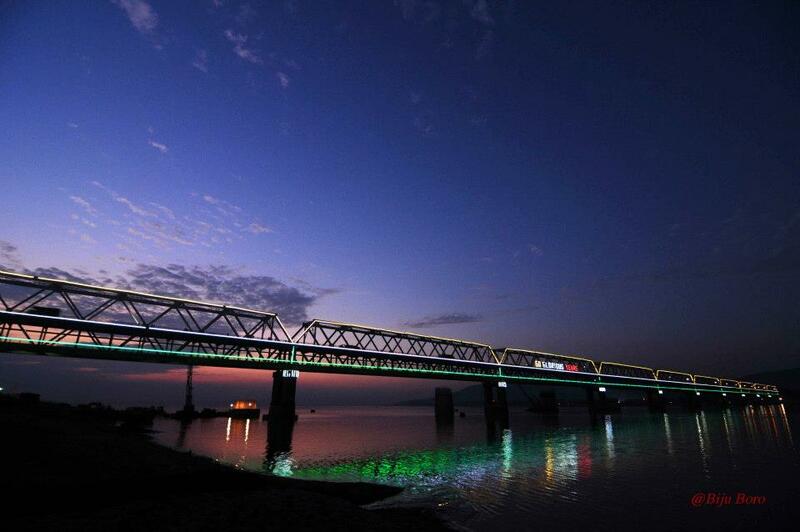 The 10.6 crore bridge was formally inaugurated on June 7, 1963 by former Prime Minister Jawaharlal Nehru. “We just cannot express the feeling we experienced at that time. We sang the inauguration song in front of Prime Minister Jawaharlal Nehru,” Singh said as his colleagues Satyabarta Bhattacharjee, Shiben Bannerjee and Dilip Kumar Mitra looked on with a sense of pride. Later in the evening these witnesses of history were felicitated. They also recounted how they were engaged to build the bridge. “The important thing was that the entire work was done by Indians. All the people including the railway and other technical officials involved in the process were brilliant. We still remember how we had to struggle against the sharp underwater current. We doubt if there is any other bridge of such quality,” Shiben Bannerjee who is also a classical music exponent told this correspondent at Pandu ghat. Altogether 14,000 tonne of steel, 4.2 milion cubic ft concrete and 40,000 tonne of cement were used to build the first ever bridge on Brahmaputra. At present Rs25 lakh per year is spent by the Railways in maintenance of the bridge. Assam governor Janaki Ballav Patnaik, Chief Minister Tarun Gogoi and other railway officials including Railways general manager S Virdi were present on the occasion. 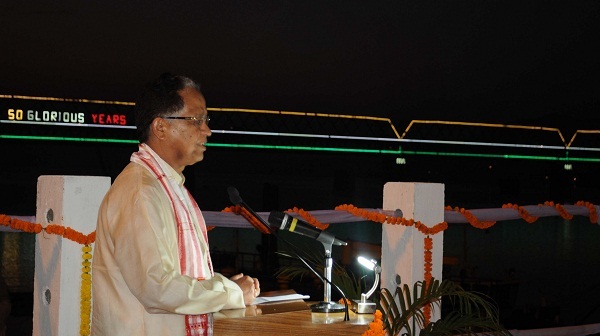 Assam governor JB Patnaik suggested that the name of the bridge should be Lachit Borphukan. “There should also be a statue of the great warrior in a commanding position along with a short description of the war written on a marble plaque,” Patnaik said.